Mr. Lv Yongzhong launched his first series of work named “Incense/Fire”, including classic designs like “Flute” incense holder, “Circle” candleholder, “Shuttle” vase that are now familiar to many people. The “Flute” incense holder in particular poetically visualized time and marked an important brushstroke in contemporary Chinese design. A research and development base was established in Shanghai to explore the processing of wood and structuring of furniture. Banmoo’s “Walking” and “Essence” series were born there. Banmoo was formally established in Shanghai. Lv Yongzhong explained his concepts of the brand on Shanghai Art & Crafts magazine. 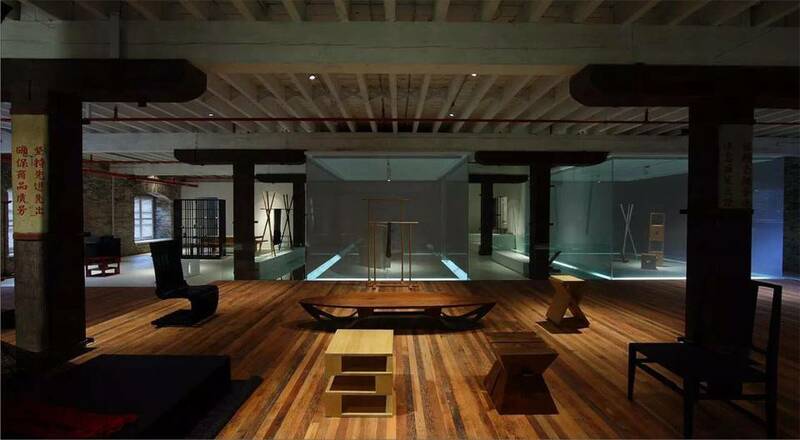 In the same year, a concept store opened in Xintiandi Shanghai, presenting a 23.5m2 space designed for a couple. A historical building by Suzhou River was transformed into Banmoo’s Shanghai Loft Boutique. In the years to come, it received many prestigious guests from all over the world, including DVF’s founder Diane von Furstenberg, Hong Huang, Sun Ganlu, Zhang Zhiqiang, UK curators delegation. In the same year, the “Boat Bench” won EDIDA China’s Furniture of the Year award, and was acquired by Today Art Museum in 2009. GQ Japan made a feature “Chinese Next Generation” in which Lv Yongzhong was selected as one of the ten explorers of the next era in China. In the same year, Lv Yongzhong was invited to deliver a speech at Business of Design Week in Hong Kong. Lv also won Trends Home magazine’s Interior Design Elites award with Ma Weidu, Zhang Yonghe, etc..
Banmoo upgraded its R&D base to Banmoo Studio and moved it to the new 3000m2 manufacturing base in Pudong, Shanghai. The production line was redesigned, and new wood seasoning plant and dust-free painting plant were added, in order to continue Banmoo’s pursuit of accurate design and ultimate quality. Cooperating with Le Magasin de Connaisseur, Banmoo held its fifth anniversary at Shanghai Jinjiang Dickson Center. Classic works such as Anhui Emperor Desk, Essence Zen Couch were displayed together with new designs from Banmoo. In the next year, several pieces of Banmoo furniture participated in the Poly Spring Auction and were warmly welcomed by bidders. A professional wood seasoning plant was built in Banmoo Studio, with its temperature and humidity carefully conditioned. Every piece of wood needed to experience three stages before it was made into furniture, so as to ensure the utmost durability. For three years, Banmoo worked on its exclusive furniture hardware and finally applied it to Anhui Treasure Cabinet in 2012. The 100% brass pulls and hinges boasted special plating and hand polishing, reaching mechanical and aesthetical perfection. The hardware was then used on many other products of Banmoo. Financial Times made a feature “China’s design renaissance” that reported Banmoo’s new work “Song Couch”. Lv Yongzhong also received a broadcasting report from BBC, in which Banmoo was referred to as a “new image” of Chinese design. Banmoo launched its showroom in Beijing’s famous art district Caochangdi packed with galleries and artists’ studios. The showroom had an appearance of a traditional academy, and immediately became a hot spot during Beijing International Design Week 2014. In the same year, Anhui Emperor Desk was invited to exhibitions in Paris, London and Austria. Anhui Armchair was used in the official events of Beijing APEC summit. Banmoo pays special attention to its furniture’s surface that has direct contact with human skin. Based on the research of different varieties of wood and the three-stage seasoning, Banmoo introduced the world’s top paint Akzo Nobel from Holland, and developed its own formula to be applied to the furniture. The surface thus had a beautiful appearance, natural and warm touch, as well as great durability, which left deep impression to the user. Having over 20 years’ experience in interior design, furniture design and fine art, Lv Yongzhong supervised the design of Banmoo’s new R&D Center, which covered 500m2 and included separate space for sketch drawing, material researching, model producing and photographing. It was an ideal place for technicians to undertake research and development projects. The upgraded Banmoo Studio covered over 10,000m2. Experienced craftsmen joined the team to work on Banmoo furniture’s frame, padding and covering. Banmoo Studio had the world’s most advanced hand-crafted wood-planing technology, knowledge about the structure of sofa, and 3D covering cutting and stitching. Lv Yongzhong was listed by Forbes China as one of “China’s 30 Most Influential Designers” in 2015 for his creative use of Eastern and Western design traditions. London based Savoir Beds, having been handcrafting luxury mattresses from curled horsetail, and invited Lv Yongzhong to produce a bed that suited the Chinese. After two years of research and development, Lv Bed was born in the collaboration of top Chinese and British craftsmen and was launched simultaneously in London and Shanghai. It was acclaimed by the media and experts as a contemporary masterpiece that was at once luxurious and comfortable. Beijing Banmoo gallery, which opened in 2014, was expanded to 1,500m2 in 2016. An independent art gallery was set, thus creating a clearer distinction between two types of space—academy and home. Banmoo celebrated its 10th anniversary in Shanghai. As one of the earliest independent Chinese interior design brands, Banmoo received wide attention from the media, art & cultural circle and the home furnishing trade in the past decade. Scholar Yi Zhongtian wrote calligraphy for the event, American architect Benjamin Wood delivered a speech, and over 500 guests attended the celebration at Banmoo Home Shanghai. Lv Yongzhong and Yue Minjun won “Artist of Life” of “Crystal Kylin Award” in 2017 that was established by the Art Display & Decoration Committee of China (ADCC). And it is the highest award in the art display design industry. Its awards category includes Aesthetic Display Space Awards Nomination, Works of Display Art Awards Nomination, Artist of Life Awards, Public Welfare of the People’s Livelihood wards and Future Awards Nomination.